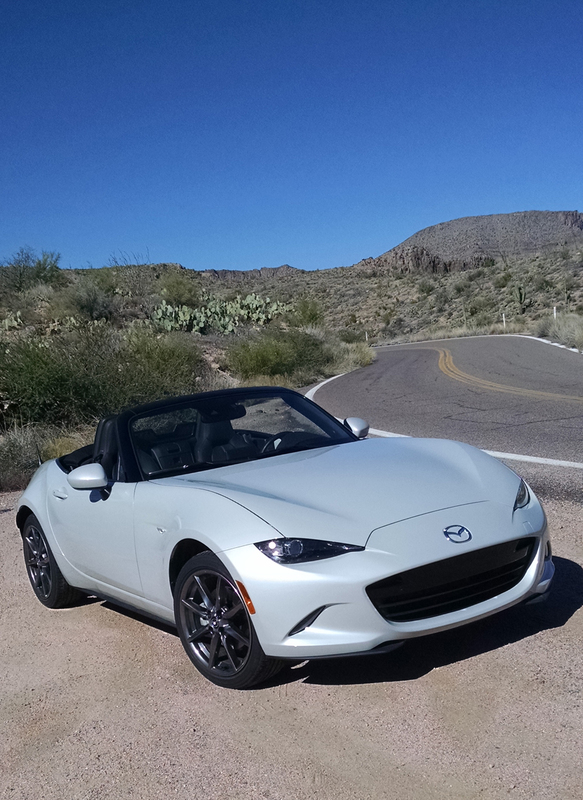 When it came time for our first drive in the 2016 Mazda MX-5 Miata, the only choice was to fight the hordes of tourist traffic and take it up to our favorite mountain road. Once past the point where the slow and doddering masses turn back for home, the road is pure, open and windy. Perfect for this car. Having owned both a first and second generation Miata, this drive was one which was a long time coming. And the first impressions set in mind after time behind the wheel was how familiar it feels, how closely related it is to the one I first drove over twenty years ago. And it should, the new MX-5 Miata brings with it the very same time honored recipe that made the first one a hit some twenty-five years ago. It’s a classic front engined, rear-wheel drive roadster, light-weight and simple down to its bones. But what’s new is its styling. Whenever you have a car which has become iconic, redesigning it is always a gamble. Do you go easy and evolve it? Or do you take risks. Here I think Mazda went somewhere in-between. It has a heaping helpings of new details that stretch the envelope quite a bit. In fact there is little or nothing to tie it to the designs of previous generations with exception of its size and proportions. And to that, this new one is actually slightly shorter than the last. The LED headlights of our Grand Touring tester are very angular and they frame a grille which is contemporary of Mazda’s KODO design language. 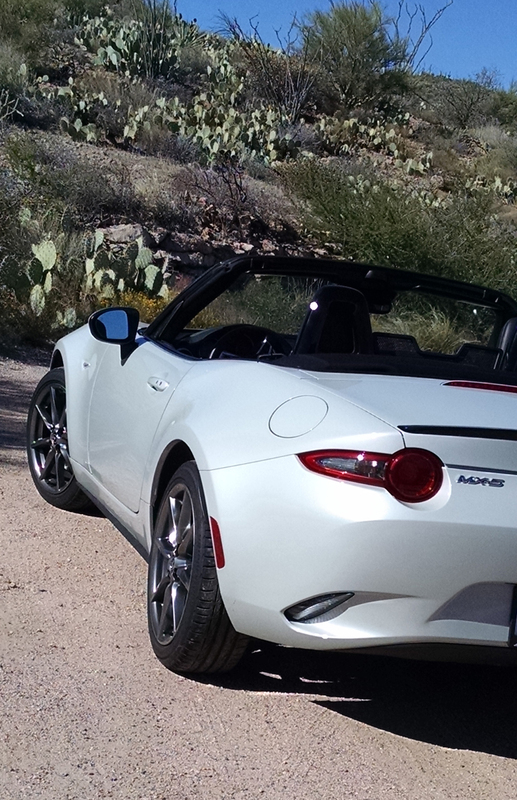 At the rear though, its tail lights are I think somewhat derivative of other cars, such as an older BMW Z4. Other angles and creases here are something I still see as a bit unexpected and I am still not sure I am on board with them yet. Wheels on ours were 17-inch alloys in a dark satin finish which I do like though. It weighs in about 150 pounds less but is two-inches wider which gives it a lower slung appearance overall. This is an awesome feat, that this car has survived for twenty-five years without gaining a foot in every direction and a thousand pounds. 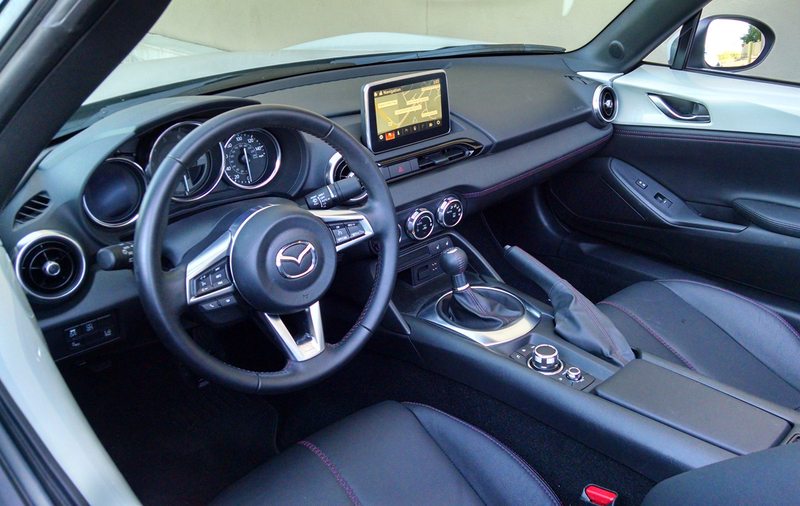 The interior of the 2016 Mazda MX-5 is where I started to immediately start fault finding though. Its design and look are subjective and based on everyone’s eye so I’ll leave that to you. But, its execution falls short in so many ways. But first, as our tester was fully loaded it had leather seats which were heated, and well finished with red accent stitching. These were good, and quite comfortable for the many all-day drives I spent here. Your passengers however might complain about the huge hump in the floor for the catalytic converter, as mine did. When we start getting to the larger picture, the parts bin nature of this cabin really kills it I think. 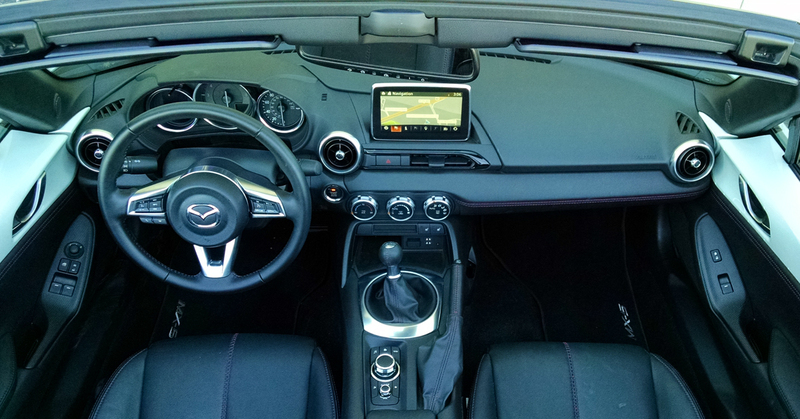 The steering wheel is good, but some things like switchgear and the infotainment system with its console puck are right out of other Mazdas, made to fit here logic be-damned. Because of the console design, these parts bin infotainment controls are well aft of your hand which forces you to pull your arm backwards to use them. In so doing your elbow hits the cup holders every time which gets annoying. Yes you can pull them out of that spot and mount them to the center console, but then they dig into your knees. 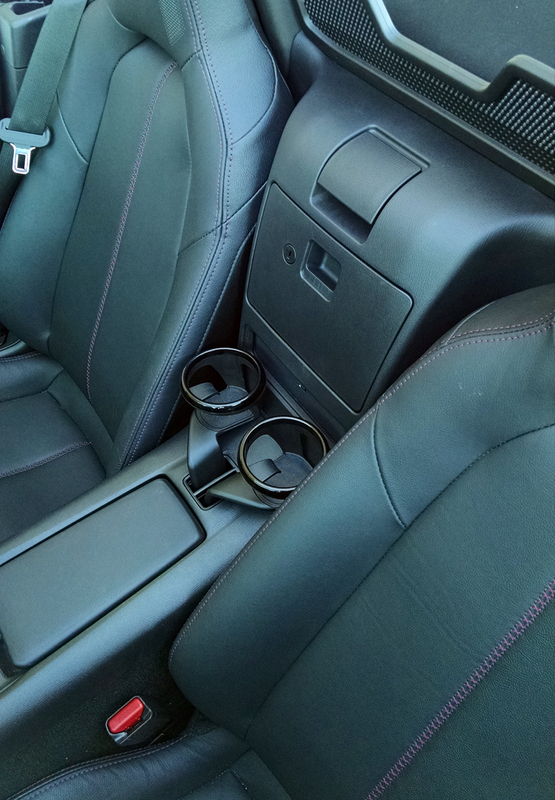 Unless you have drinks with you, you want to throw them in the center console storage area, which is behind you too and hard to reach when driving. And that is your glove box, there isn’t one in the dash. Also behind and center is the CD player. Really? The CD player could not have been put in the dash? 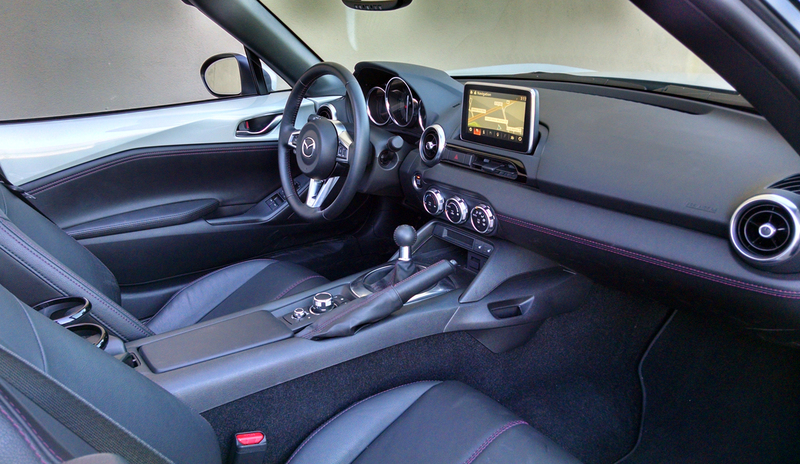 For that matter, why couldn’t the infotainment controls have been put there too where its natural to use them, or let us use the touchscreen while the car is in motion. Using the system is frustrating but at least sounds good being the premium level package. And while a car like this seems a silly place for driver aids like blind spot warning and lane departure warning , it had it and it worked well. So overall here technology gets 4 of 5 stars. Now it sounds like I’m bagging on the car already, but these are genuine gaffes most which could have been avoided I think. On the other hand one could say a car like this always comes with compromises, and I would agree with that. And alas, it’s not all bad. This is because with the top down at speed the car becomes another place. It’s a seat in the journey of freedom and open air, and one which is quiet enough to talk to your passengers without raising your voice. 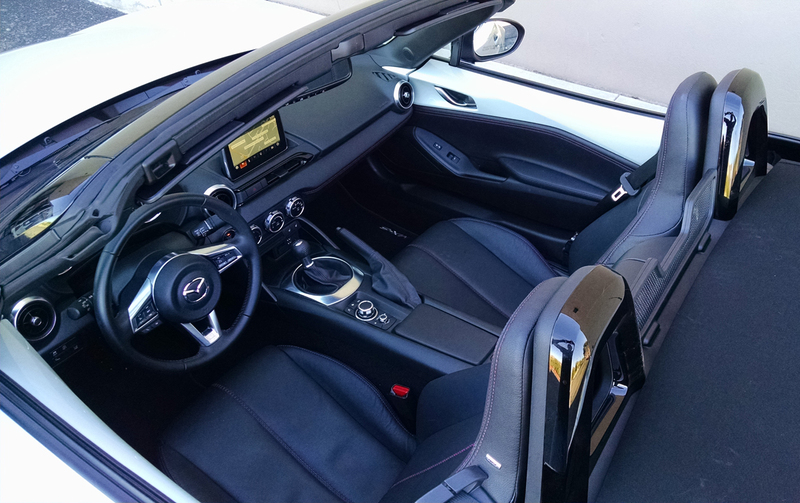 Putting the soft top up and down is easy and simple, and for most drivers can be done right from the driver seat. Shorter drivers in our office could not make the backwards reach over the windscreen to tamp it down though and had to exit the car to do it. Trunk space is impressive I think for this car and the well is fully lined which I could not say for my old Miatas. The nice size is in part because there is no spare tire here, but you do get a tire puncture repair kit. Overall the interior I think is very much a comfortable place to live, work and play though you do give up a lot in ergonomics, storage, and even some levels of material quality here for the privilege. In that way, it earns only 3 of 5 stars here. 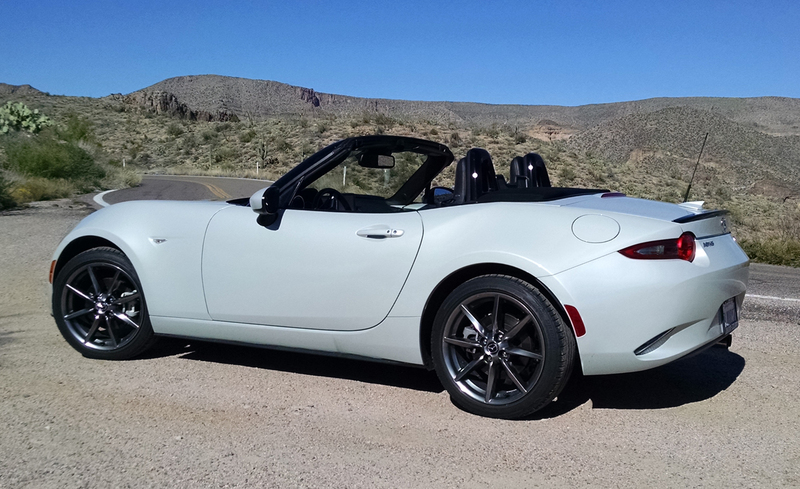 The chassis of the 2016 Mazda MX-5 may just however be its saving grace. 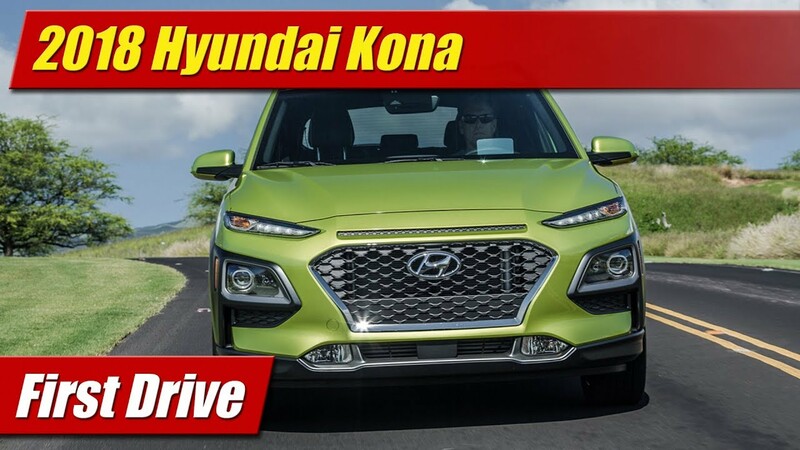 It comes with the latest evolution of the company’s front-engine rear-drive architecture comprised of a double wishbone front suspension and a multi-link rear. 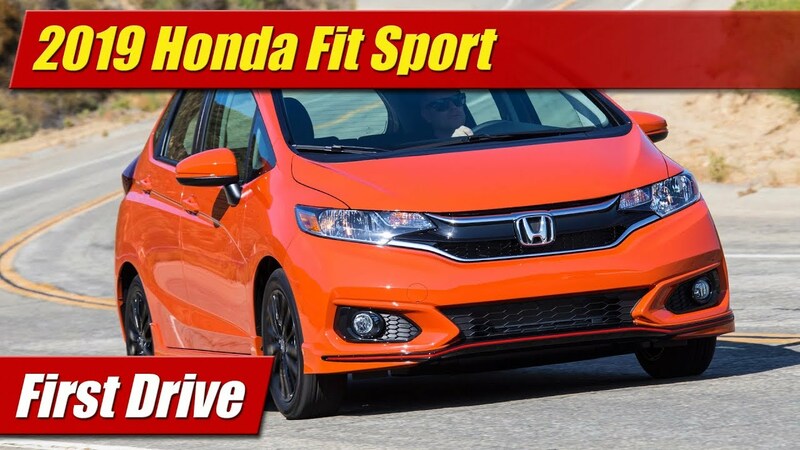 Suspension is mounted to sub-frames front and rear while its powertrain components are tied together with a longitudinal backbone structure to keep it all feeling solid when you start to really push the car and do what it does best. 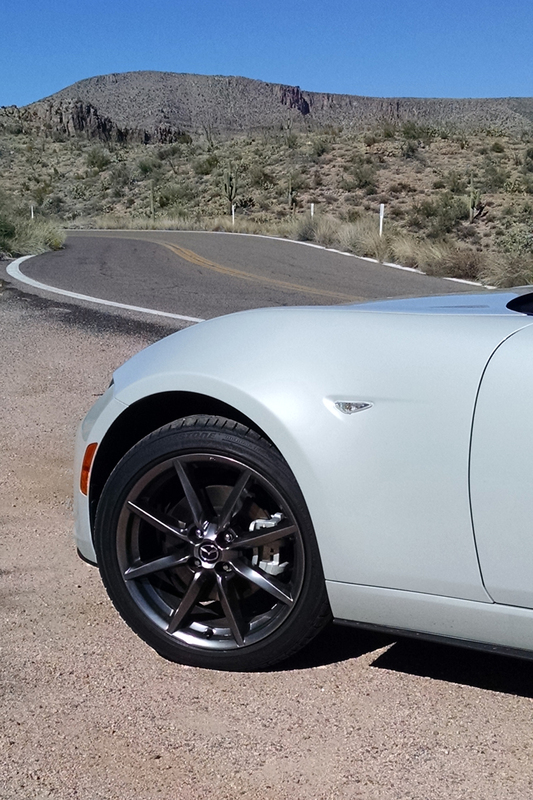 When pushed into the tight corners of the Apache Trail well east of Phoenix, the car came alive in ways few others do. It’s light and balanced, it’s flingable and forgiving. It doesn’t push nor does its tail step out in unexpected ways. It’ll do both if you set it up to do so but its precisely controllable and predictable. Refinement comes to mind as it stays planted without a shudder over rougher pavement, never seeming to be unsettled by dips and irregularities which make other cars feel like they lost their footing for a moment. Steering is light and seems to offer good communication of what’s happening down below in spite of its electric assisted rack. 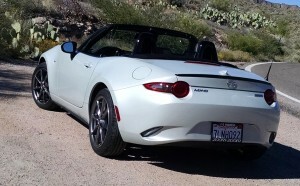 It isn’t made to feel artificially heavy like many, which to me fits this cars fun and light hearted personality well. A day driving this car with its top-notch chassis made me forget mostly about all my complaints about the interior details. It really does bring all the refinement and happy go-lucky goodness from previous generations to the modern day. And for that it earns 5 of 5 stars in the chassis department. Motivating the new MX-5 is a 155 horsepower 2.0 liter “SkyActiv” four-cylinder engine. It does come this year with less power by about 12 horses. Torque is however up by 8 to 148 pound-feet. The good news here is that I really didn’t notice the difference given the lighter weight of the car. It’s quick enough to be fun and put a smile on your face, not fast. Push it hard and its sounds will massage your happy buttons deep in the brain someplace. The engine loves to rev, and you’ll need to do so. Because it’s smooth and velvety, you’ll never regret the chore. 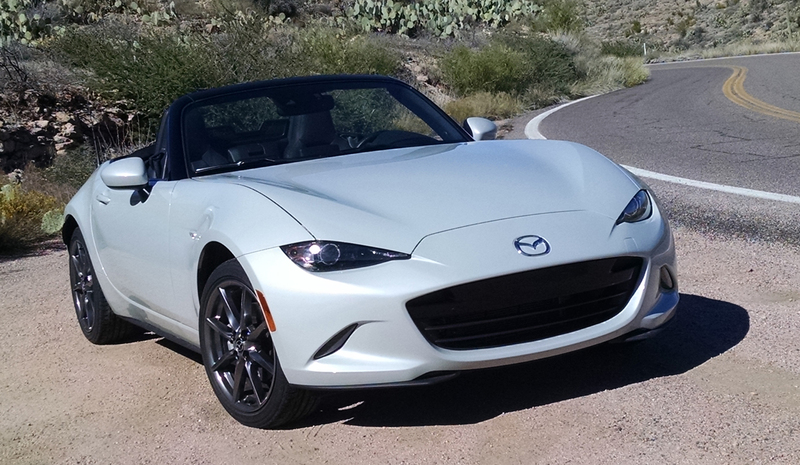 Our 2016 Mazda MX-5 tester with the six-speed manual is rated by the EPA at 27 mpg city, 34 mpg highway and 30 mpg combined. In my week with it even including this mountain day of video shooting I achieved 31 mpg combined. 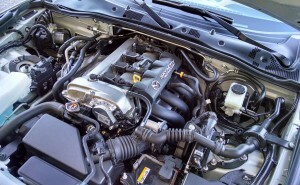 There is talk of Mazda offering a more powerful 2.5 liter four-cylinder engine here and that would be a welcome thing, but as I already expressed the 2.0 liter is more than enough to put a smile on my face. 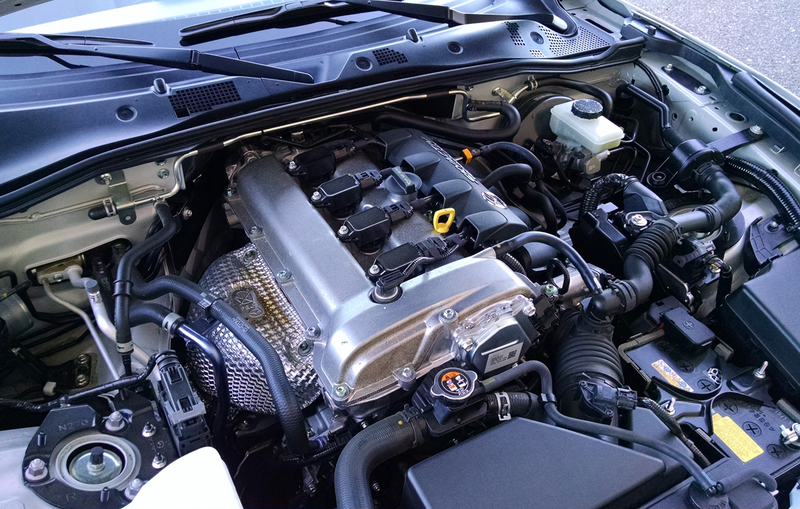 In scoring the powertrain, I can’t help but to give it 5 of 5 stars. 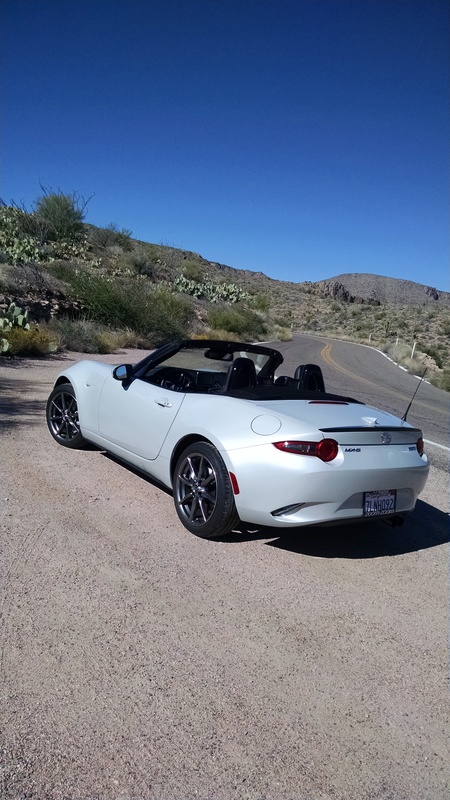 When you step back and look at it, touch it, and live with it, the MX-5 is a well put together piece which you would expect coming from a factory in Japan. 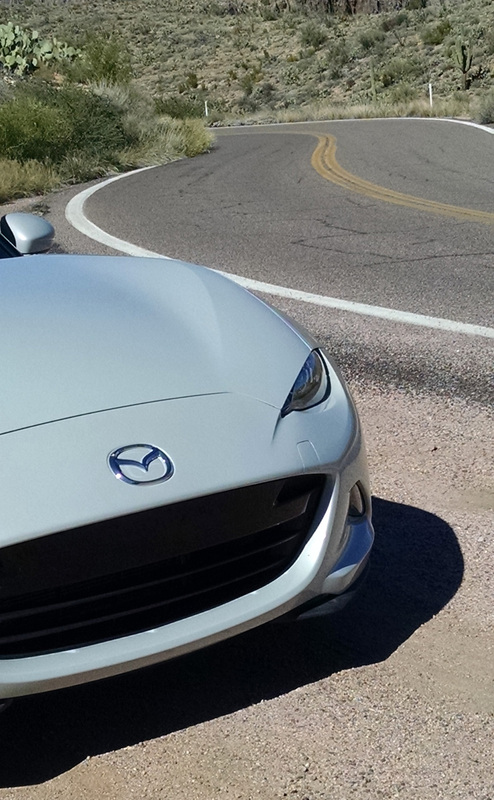 The paint finish is good, the body fit is good, and it felt solid all around, even on rough pavement. And that is saying a lot for a convertible of any stripe. So for quality feel, it earns 5 stars. 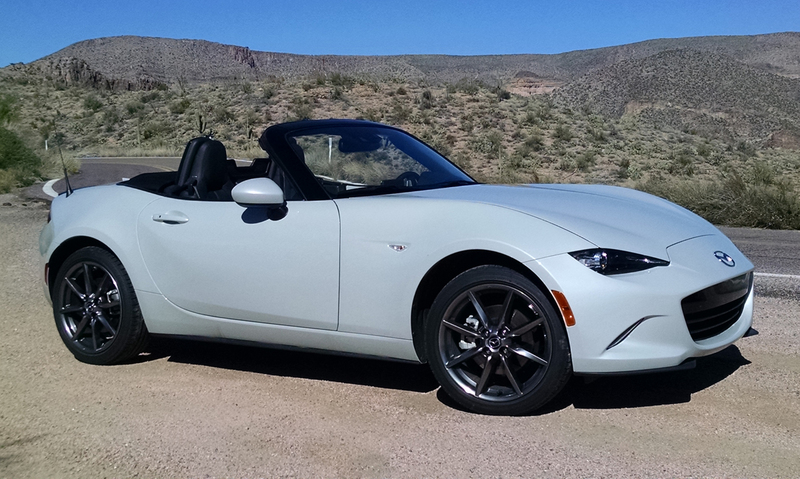 Our Grand Touring trim grade with a few options including a rear deck spoiler and keyless entry came to $31,365. You can spend a bit more but we are close to top out on price. And even here, near $6,000 above its starting price I feel it’s a great value. After all, how many other cars can you compare it to which are in the same price range? Therefore, we rate its value at 5 of 5 stars. 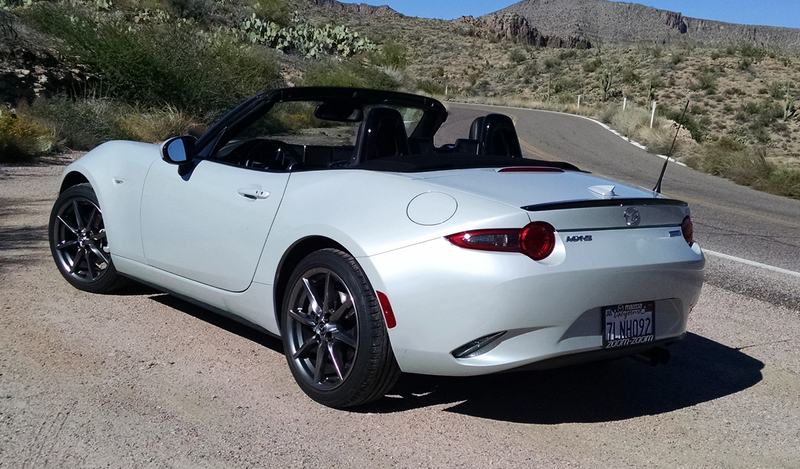 When you roll all of our ratings together, that gives the 2016 MX-5 Miata a final score of 4.5 of 5 stars. And finally, the car goes on our TestDrivenTV “I’d Buy It” list. I liked it that much in spite of its interior full of afterthoughts and exterior styling I’m still not entirely ready for. It’s so fun to drive, that you can overlook a lot of the little things. And that in the larger picture is what this car’s mission in life is.